Justin Palmer’s project, “The Age of a City,” tracks the age of buildings in Portland, and draws on open data (courtesy of Justin Palmer). Learn more about the project here. Let’s become a landmark city for transparency, equity, and accountability. Catherine Nikolovski, Director of Hack Oregon, is our guest author for this month’s call-to-action. This post is abridged from the original version, which you can read here. Imagine a city in constant connection. Imagine a city that’s adaptive, inquisitive, and inclusive by default. Imagine a city where the same information our leadership uses to make decisions is also accessible and understandable to every citizen. Imagine a city that admits what it doesn’t know, and looks outward for new solutions. A few years ago, that was the dream that inspired Portland to lead the charge in becoming an Open Data City with one of the country’s first public transparency resolutions. Today, with your help, we have an opportunity to make big progress on that dream. ● Open by default, in the public domain, freely redistributable, and adhere to open standards. Exceptions may be made due to compelling concerns of privacy, security, liability or cost, and should only be granted in accordance with clearly defined criteria and oversight. This might seem small, but the concept of linking land use and physical space to open data and digital space has enormous potential to define the next decade of Portland’s commitment to equity and quality of life. Here’s why this is so critical: Very often the communities who are the most economically vulnerable also lack the most services and infrastructure. For example, perhaps you’ve noticed that public transit tends to run less frequently and more inefficiently in places of higher poverty — exactly where people are likely to rely on it the most. What’s different now is that we have the data to prove it. That’s because once we can define a problem, we can begin to solve for it. In this day and age, if knowledge is power then data is accountability. The city’s point of view is that an open data policy doesn’t belong in a land use plan. But the reality is, as communities increasingly rely on the internet and information-sharing to participate in economic, educational, and civic activities, we need to ensure that our digital connectivity is planned as intelligently and equitably as we would our physical neighborhoods. This becomes a conversation about how fundamental opportunity gaps are by defined by the spaces where we live. If we think about digital inclusion as the backbone of building and maintaining thriving neighborhoods, then it’s hard to imagine that data isn’t an indivisible part of urban development. Our dream is still achievable. Portland can set the stage to become an international model as an open data city; but we need to stand together and commit to a long-term plan which promotes digital equity, responsiveness, and data-driven decision making as intrinsically linked to supporting healthy communities. Let’s tell City Council what kind of Portland we want to live in, and send a message urging them to include open data in our Comprehensive Plan. Subject: Data and Development are Indivisible. I would be proud to live in a city that supports equal access to information for everyone. We deserve a 21st century Plan rooted in the values of digital equity, and I urge you to stand up for Portland’s commitment to inclusion and a transparent governing process. 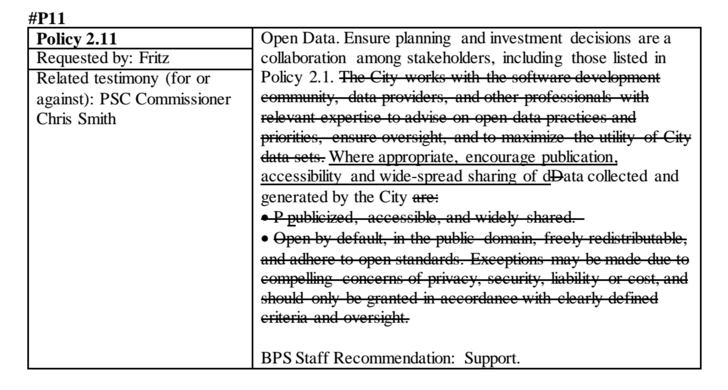 Please keep the open data proposal for Policy 2.11 intact. This is an event hosted by the city, but if you’d like directions and an email reminder in your inbox, here’s a link I’ve made to register here. Pro Tip: For those of you who have never been to an event like this, it’s considered polite to refrain from clapping and noisemaking during the hearing. Even though things may get heated, if you support something, the official preferred method of demonstrating approval is with “jazz hands”. Now, close your eyes, and imagine a room full of people triumphantly raising spirit fingers to restore democracy. That part we definitely will make a reality. Please, share this article with your friends. As always, you can find PICOC at picoc.org, on Twitter, and on Facebook. Here’s more about our origin story, and January and February’s calls to action.